M66 is a spiral galaxy that is a member of the famed Leo Triplet group, which also contains M65 and NGC 3628. M66 is an intermediate spiral galaxy that appears to have been affected by the gravitational fields of its neighbors. That is, it has central mass high concentration and a non-corotating section of H1 material that was pulled from one of its arms. 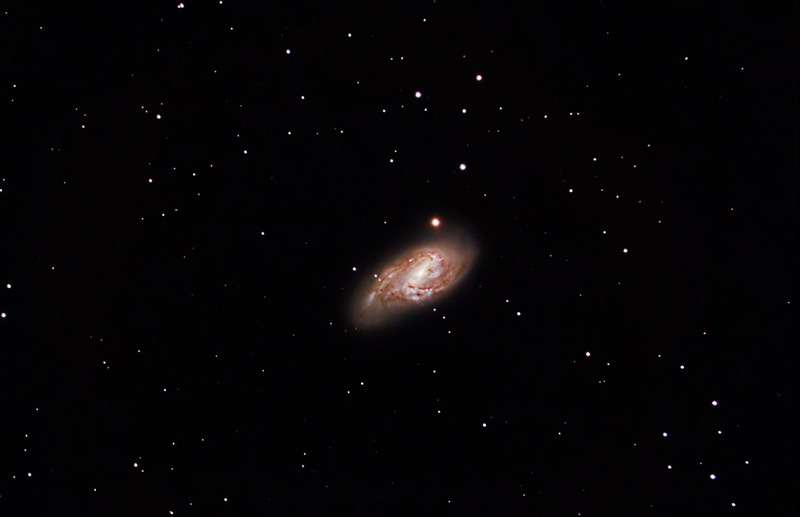 M66 was discovered by Charles Messier in 1780. It is estimated to lie 35 million light years away and have a diameter of 90 thousand light years. Exposures: 26 @ 5 min. Images were focused using a Bahtinov mask and the camera's live view function. The subframes were calibrated, aligned, and combined in ImagesPlus. The composite image was adjusted in Photoshop. Sharpening and noise reduction were done using Topaz Detail and DeNoise respecitively. Vignetting was adjusted using GradientXTerminator.